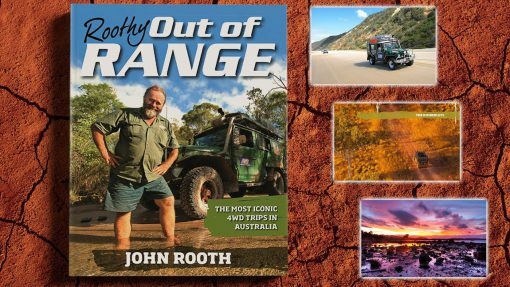 With Roothy as your guide, Out of Range takes you on seven of the most iconic 4WD trips in Australia over 200 pages with stunning photography. There’s sandy deserts to cross, snowy mountains to climb, crocodile swamps to plunge through and sun-drenched beaches to soak up. Roothy has spent over 25 years exploring the most remote and spectacular locations across this great country and inspiring thousands to discover the Australian bush. 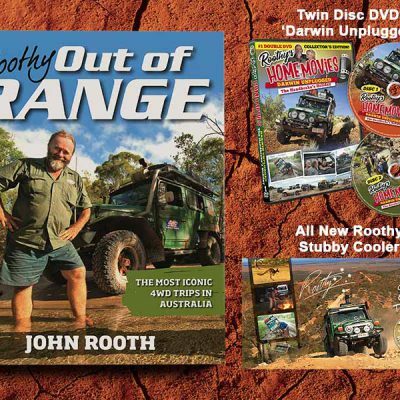 These signed copies of Out Of Range are exclusive to the Roothy.com.au store and every copy comes with a Roothy vehicle sticker. With Roothy as your guide, Out of Range takes you on seven of the most iconic 4WD trips in Australia. Over 200 pages, there’s sandy deserts to cross, snowy mountains to climb, crocodile swamps to plunge through and sun-drenched beaches to soak up, all captured with stunning images. Roothy has spent over 25 years exploring the most remote and spectacular locations across this great country and inspiring thousands to discover the Australian bush. Where a little trip is thousands of kilometres and a busy place means someone’s been there before, you’ll smell the dust, the rain and the diesel on every page. This is the story of one man’s love for his country his truck and some of the more incredible adventures they’ve shared. These signed copies are exclusive to the Roothy.com.au store and every copy comes with a Roothy vehicle sticker. Geez you look just like a bloke i used to know by the name or Westy,,this isnt you is it Roothy?